Happy December you guys!! This time of year is my favorite time. We just celebrated Dave's birthday and Thanksgiving, and next we have my birthday, and then Christmas! Every year, I run into the problem that I am so busy making a list of what I need and want to buy everyone for Christmas, that I completely forget to put together a list for myself. So this year I've done just that. This list is a little bit all over the place, but all of these things are things that I really want, not need. I have been dying for a robe for so long, and this Josie Maran set is something I have been eyeing every time I go by Sephora. I stopped by the mall yesterday, and purchased a couple things while the Black Friday sales were still happening. I am proud to say that I'm almost done with my Christmas shopping! Only my Dad and Dave's Dad are left! Do you make your wish list ahead of time? Anything special on it this year? How far are you with Christmas shopping? When is your birthday? Mine is the 13th! Hope you get everything you want! Happy (early) birthday! 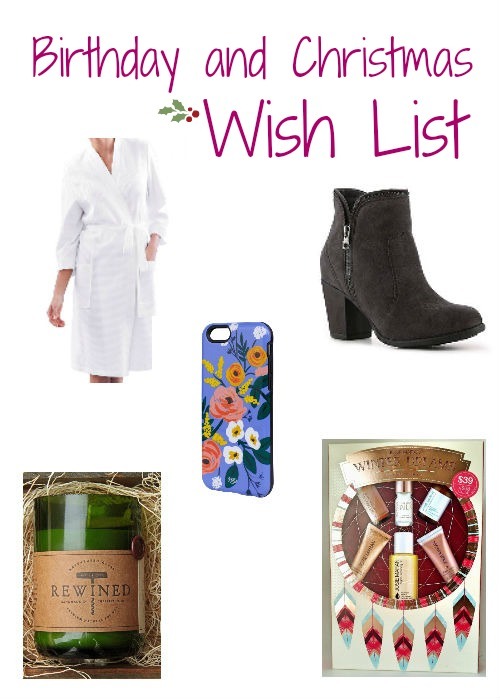 I may need to add that Pinot Noir candle to my wish list! If you end up getting that Josie Maran set I would love to know how it is! I just love her stuff. I love December birthdays, mine is the 30th! When is yours? Great holiday picks! Haha! It's okay, the things I asked you for I definitely need! !